In sports betting a parlay is a wager which effectively combines two or more wagers into one. You make multiple selections, and all of those selections have to be correct to win. If a single selection is incorrect, you lose the wager. This makes it hard to win parlays, particularly ones that include a lot of selections. However, parlays are not the "bad bets" that many claim them to be. It does require some skill (or a great deal of luck) to get them right with any degree of regularity, but the potential payouts mean you can make very good returns when you do. You would make a lot more from a winning parlay with four selections than you would from winning four single wagers on the same selections. The high potential payouts are precisely why parlays are so popular among sports bettors. It is important to understand exactly how they work though, and how the potential payouts are calculated, so we've explained all this below. We've also provided details of an alternative type of parlay – the progressive parlay. Parlays can be a useful tool in your overall betting strategy. If you would like some advice on how best to use them, please see the following page. We've already explained the basic concept of parlays – that they are wagers where you bet on multiple selections with a single stake. A simple example would be a three team football parlay, where you select three football teams to win their upcoming matches. This is essentially combining three moneyline bets (or win bets) into one. You would place a single stake, and if all three teams win you would receive a return based on the relevant odds. If just one of the teams loses, though, you would lose the whole bet. Football parlays are particularly popular, as are basketball parlays, but they can be on virtually any sport. Most bookmakers allow you to place parlays across multiple sports too; for example you could place one containing selections on football matches, basketball matches, hockey matches and tennis matches. Parlays don't have to combine just moneyline bets either. You can also use point spread bets and totals (over/under). You may be able to use prop bets and futures too, although not all bookmakers allow this. The minimum number of selections you need to include in a parlay is two. The maximum number varies, depending on the bookmaker you are using, but 15 is fairly typical. The more selections included, the higher the potential payout. Of course, more selections also make it harder to win. That's really all you need to know about how parlays work, apart from one final point. Different bookmakers, whether online or offline, will all have their own set of rules relating to parlays. For example, they may deal with pushes (ties) or cancelled games differently. Before placing a parlay of any kind, it is a very good idea to read through the relevant rules so you know exactly where you stand. The single biggest appeal of parlays is the fact that the potential payouts can be high relative to the amount staked. You should therefore have some idea about how these payouts are calculated. This is not exactly vital if you're betting online though, as your sports betting site will automatically calculate the potential payout before you place a wager. You can see this from the screenshot below. It still doesn't hurt to understand the mechanics of how the payouts are calculated, so we'll go ahead and explain. There are actually two possible methods that bookmakers use for the calculations, the first of which involves simply multiplying the odds of all the selections contained within the parlay to calculate the overall odds for the wager. This is used when the odds for each selection are different. 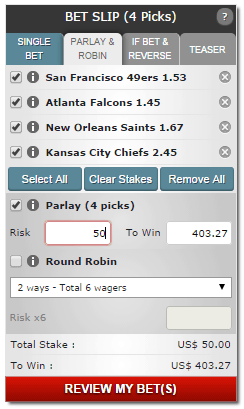 The parlay in the screenshot above contains four selections, at decimal odds of 1.53, 1.45, 1.67 and 2.45. To calculate the overall odds for the parlay you would therefore multiply these four numbers together. This gives you 9.077 (rounded to three decimal places). Based on these odds you would expect a $50 wager to repay a total of $453.85, which is $403.85 in winnings and the $50 original stake. The bet slip in the screenshot displays the amount that can be won, which is $403.27. This is slightly different from the number we calculated above, which is purely down to issues with rounding decimal places. Nonetheless, the method outlined here works to give you a very close approximation of what your potential payout maybe. The second method that bookmakers use is a structure where the odds are fixed based on the number of selections. This is used for parlays that contain point spread bets and totals bets where the odds are the same for each selection (typically -110 in moneyline odds). The exact payouts within such a structure may vary from one bookmaker to another, but they will usually be along the lines of the below example. Progressive parlays are a lower risk alternative to standard parlays. They are a little more forgiving as, unlike standard parlays, they are not automatic losers if one single selection is incorrect. Up to three selections can be wrong (depending on the total number of selections) and the wager will still return a payout. There is a tradeoff, though. The payout is less than for a standard parlay if all of your selections are correct, and it reduces even further if any of your selections are wrong. Again, the exact payouts will vary at different bookmakers. The following chart is a typical example.